Tisbury selectmen navigated stormy seas during a public hearing on an amendment to the town’s shellfish regulations Tuesday. The proposed rule that was the focus of the hearing provided a platform for a discussion that generated accusations of double-dealing from fishermen on both sides of the issue. Shellfish constable Danielle Ewart appeared before the selectmen, flanked by members of the shellfish committee, to ask that the shellfish regulations be amended to prohibit the transfer of shellfish from one fisherman actively fishing in one boat to another commercial fisherman, thereby allowing that person to check the catch in under his or her license without having actively fished. Selectman Tristan Israel questioned the purpose of the amendment and asked why, if a person held a commercial license, the distinction was important. Committee members and commercial license holders Steve Baccelli and James Tilton said the amendment was a way to close a loophole that could be exploited. Edgartown and Oak Bluffs enforce a similar rule that prohibits the transfer of catch, they said. Continuing on his conservation course, Mr. Sweeney referenced a regulation not the subject of the hearing that allows only two commercial limits to be landed per boat per day. Mr. Sweeney said that if boats could be handed off so that four people could use one boat it would generate more pressure on the resource. As the hearing progressed it soon became clear to selectmen that the proposed amendment floated on undercurrents swirling around commercial fisherman Glenn Pachico and efforts he said were forced on him to circumvent a rule that prohibited him from sharing his scallop boat with his sons. Mr. Pachico, flanked by his two sons Tyler and Mitchell, and his son’s friend Michelle Katz, began his comments with a prepared statement in which he described his family’s deep fishing roots in Tisbury dating back to his great-grandfather. In his statement and comments that followed, Mr. Pachico described the nub of the problem as the shellfish committee and the constable’s unwillingness to allow his boat to be used by the three other members of his household who hold commercial licenses, his sons and Ms. Katz. Mr. Pachico said that before the scallop season he explained his situation to Ms. Ewart and members of the committee and asked if he was going to have to build another scallop boat. Mr. Pachico said the constable told him that if he informed her who was in the boat in the morning and who was in it in the afternoon it would be fine. “Whether she meant it or not, she said it,” Mr. Pachico told selectmen. Mr. Pachico said once the season began he was told he could not use the boat in that manner. In an effort to allow his son to keep fishing Mr. Pachico said he reverted to dumping a culling board of scallops in shallow water where his son would be waiting to harvest them with a dip net. “They didn’t like that,” he said. His next step was to send his son out in an aluminum boat and dump scallops onto his son’s culling board. Mr. Pachico provided selectmen with a litany of perceived insults and injustices directed at him and his family. “That’s why we’re here today, not because people are trying to steal scallops. I was dealing with the situation that was dealt to me. “It was the inefficiency of that committee not to tell me yes or no in the beginning and not having any kind of compassion for my situation at all,” he said, pointing to where the committee sat. The selectmen advised Mr. Pachico to return to the shellfish committee Thursday night with a formal proposal to change the restriction against sharing a boat in order to follow the proper procedure, then return to the selectmen. The selectmen unanimously approved the amendment to the regulations that was the subject of the hearing. Outside town hall, the war of words continued between Mr. Sweeney and Mr. Pachico. A recreational family shellfishing license costs $40 and limits a family to one bushel per week. A senior citizen can obtain a license for a discounted fee of $5. A resident commercial shellfishing license costs $350 and allows a fisherman to daily take three level bushels of scallops Monday through Friday. On the weekend a commercial fisherman can also fish his or her recreational limit and add another bushel to his weekly harvest. An average bushel, depending on the size of the scallop, yields about seven or eight pounds of scallops. The price paid to fishermen is between $12 and $15 per pound. That can amount to an approximately $250 payday depending on the price per pound and minus boat operating costs. Tuesday night Ms. Ewart said that the commercial season began with about 22 active commercial fishermen. That number has since dwindled, she said. “For a while we were pulling up 66 plus bushels daily,” she said. Ostensibly, the rule allows a shellfisherman to assist a person who would otherwise be unable to fish to take advantage of the resource. Ms. Ewart told The Times that “about” 15 people currently take a bushel under that provision; however not everyone takes one each week. Fishermen and town officials acknowledge that some permit holders take advantage of the town’s generosity to increase their personal harvest. However one shucks it, some elderly people eat a lot of scallops. In the current calendar year Tisbury has sold 31 commercial permits, 486 residential family permits and 183 non-resident family shellfishing permits, which includes $25 weekly permits popular with summer visitors. Tisbury taxpayers contribute generously to provide a bountiful shellfish harvest and manage the resource. At annual town meeting last June, voters approved a shellfish department budget of $115,646. That total included $76,946 for salaries, $8,700 in expenses and a $30,000 contribution to the Martha’s Vineyard Shellfish Group. Voters also agreed to spend $23,127 for a new truck. 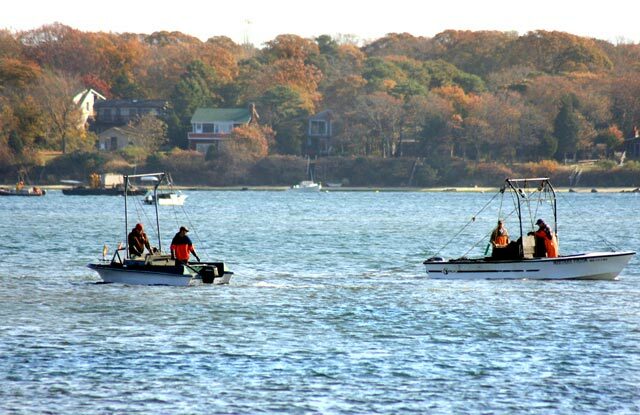 According to the 2010 town report, commercial and recreational shell fishermen harvested 1,300 bushels of scallops, 783 bushels of quahogs and 24 bushels of soft shell clams from Tisbury waters in 2010. In 2010, the sale of family and senior resident permits totaled $12,435. Non-resident family permits accounted for $5,407. The sale of commercial permits totaled $6,600.